Aerial Photographs of the Ansel Adams Wilderness will give you a great overview of the beautiful terrain that you will encounter when hiking, backpacking, or climbing in the area. As mentioned on other pages, the Ansel Adams Wilderness contains some of the most beautiful landscapes in all the Sierra Nevada. The above aerial photo was taken from a Light Sport Aircraft at an elevation of about 12,500 ft. Ediza Lake is used as a launch point for many climbers in this region. Above, you see a birds-eye view of Garnet Lake and Thousand Island Lake. These two lakes, along with many others, are a fisherman's paradise. The photo also shows you the terrain around and in-between these prominent lakes. When you combine these photos with the trail map located on our Ansel Adams Wilderness page, you will begin to get a real good idea of the topography of this wonderful location in the Sierra Nevada. After spending a bit of time over past few years in my climbing partner Mike's Ultralight Plane (and studying the resultant photographs), I can see why Aerial Photography is a key tool for making up topographical maps. This is why we at Timberline Trails will try to include both tools when describing the various adventures that you as a reader may be interested in. In the above aerial photograph, you see a view of the southern area of the Ansel Adams Wilderness. 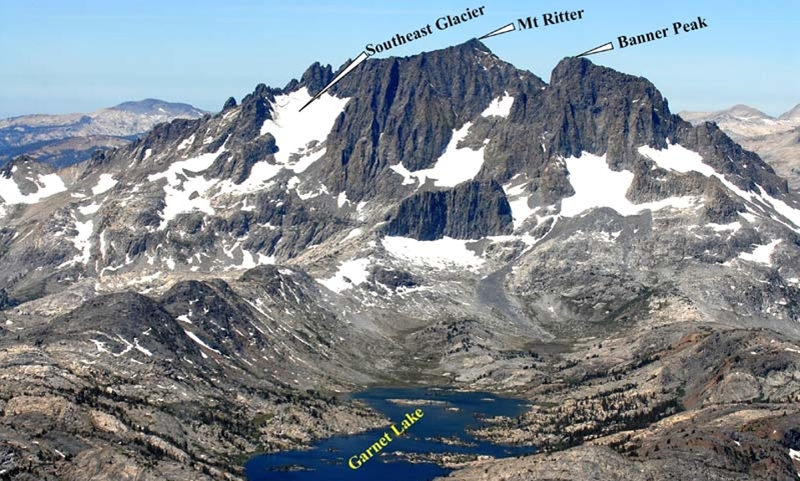 Most climbers approach the climb up Mt Ritter, Banner Peak, and the Minarets from the south-eastern approach. Ediza Lake is a very popular area to set up camp for attempts on Banner and Ritter, and Iceberg Lake (not shown here) is a great place to set up camp for climbs up the Minarets. We set up our High Camp just below the Southeast Glacier in order to get a real high start on our Climb up Mt Ritter. Moving in closer to the peaks gives us a closer view of Mt Ritter and Banner Peak. Also as you can see beautiful Garnet Lake provides a beautiful foreground in this aerial view. Garnet Lake is the destination of many backpackers. To the left is an aerial view of the Minarets. These jagged peaks are still the destination of climbers (even though the rock is not all that solid). Because of this, the Minarets have had there share of tragedies in the past, and in August 1933 they were much in the news when Walter A. Starr, Jr. was reported overdue from a trip to the Ritter Range. A search party, made up of some of California's best climbers, was then called in to search for Starr. This activity went on for several days, but on August 19, the search was called off. Only Norman Clyde remained and continued the search. It took some persistent effort on Clyde's part, but after several days of climbing and hiking, Clyde ended up finding the remains of the fallen climber on a remote ledge in the above Minarets. (The story ends with Clyde returning a few days latter to bury the remains of Starr Jr, along with the help of Jules Eichorn, on the ledge where Starr had come to rest). This story serves as a reminder to the inherent dangers of climbing. 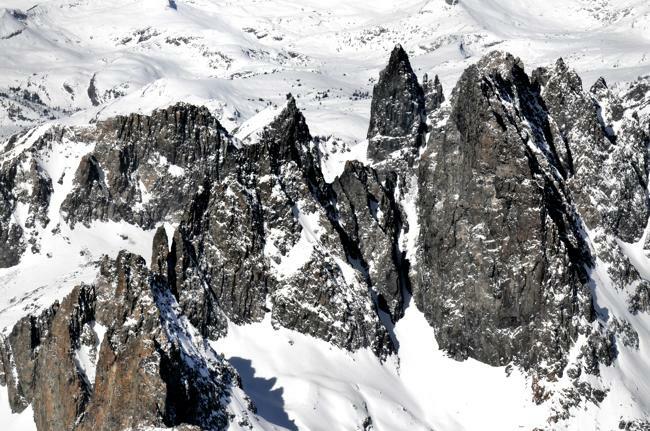 The Minarets (along with both Ritter and Banner) are notorious for loose rock, so extreme care must be taken if you decide to climb in this area. However, to end on a more positive note, I would just like to say that the Minarets (and their surrounding areas) are beautiful indeed, and if you ever decide to explore this part of the Sierra Nevada, you certainly will not be disappointed.